Winter can be hard on all things household, and this past winter was a dickens. Along with record cold, the quantity of snow that fell caused all sorts of headaches for me at the cabin. In years past, when snow built up to a certain level, the first warm day that came along would break the friction hold, and the snow would slide off harmlessly. Not so this year. It just built up deeper and heavier with each snowfall. I shoveled off a good portion of it, but my error was to overlook the portion nearest the peak of the roof. I thought by removing most the weight, the roof was safe from collapse. I never once gave the chimney a second thought. That first warm day finally came along, and once the roof heated up, the remaining snow finally broke loose. 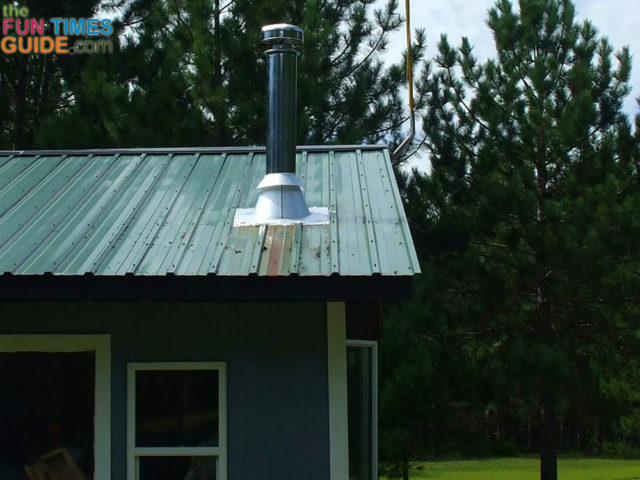 With a few feet to build up some momentum, when it hit the chimney it simply folded the section of metalbestos over and sheared the flange completely off the roof — leaving behind an open hole about 10 inches across! With weeks of winter left to deal with, I installed a temporary tin patch over the hole. This gave me time to purchase parts and wait for a warm day after the remaining snow had completely melted from the roof to make permanent repairs. 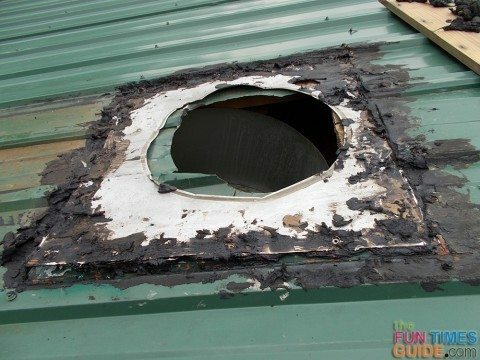 Fortunately, I had most of a gallon of Wet or Dry Plastic Roof Cement and a scrap piece of tin which I used to cover the hole. A handful of sheet metal screws secured the patch in place, and I headed to town to buy parts. Weeks later, with parts in hand, it was time to make permanent repair of the chimney. 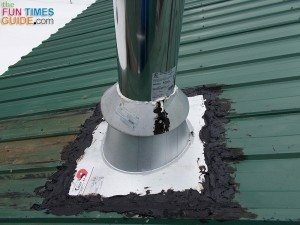 By using the same roof cement last year to stop a leak, the job was made easier because it is the type that remains pliable. Using a putty knife, I scraped off the old sealant exposing the self drilling sheet metal screws. The new flashing was an exact duplicate of what was damaged, so once the screws were removed the new one was slid in place and screwed back down. The first section of chimney was lowered into place, making sure it correctly passed through the fire shields and ceiling support box. The second section of chimney was installed with a twist lock motion. Then the original cap was reinstalled, and the chimney was looking like normal again. A fresh coat of plastic roof cement was applied around the seam of the flashing and over all screw heads. 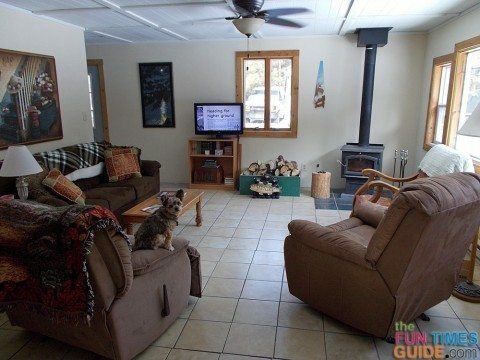 The final step was to slide the wood stove back into place and make the final connection from the stove pipe to the chimney — where it comes out from the ceiling of the living room. I was fortunate that there was no water damage from the missing chimney. 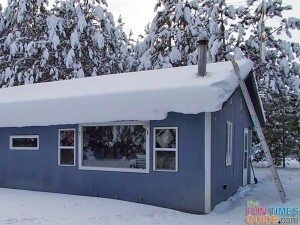 My weekly trips to the cabin seem sufficient to catch problems before they become disasters. 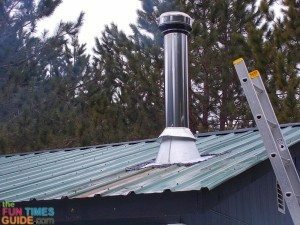 It was annoying to repair the metalbestos chimney in the middle of winter, but aside from being careful not to fall off the roof, it wasn’t that big of a deal. 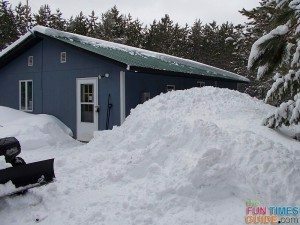 For sure, if this heavy snow becomes a reality next year, I will shovel it all off instead of calling it good enough when most of the weight is taken care of.